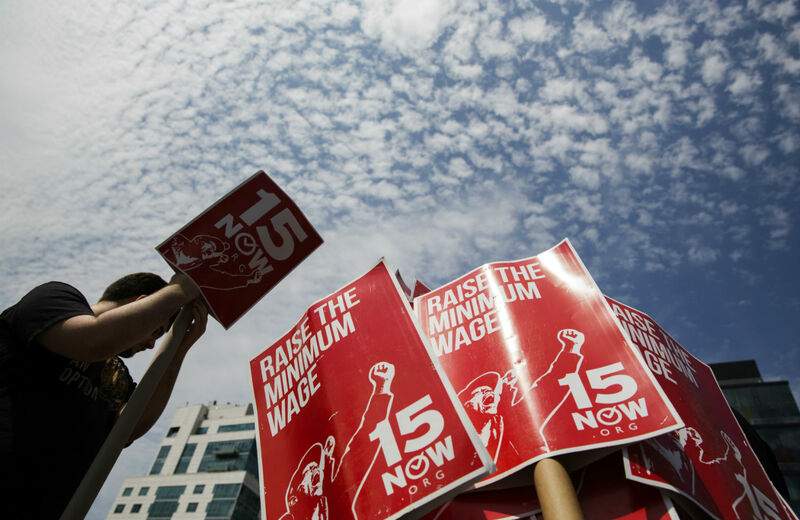 Minimum-Wage Workers Just Got a Raise, but Will Bosses Steal It? This year’s midterms raised the minimum wage in four states and two cities across the country—now it’s time to make sure those wages get paid. Amid a pile of Election Day defeats, one bright spot was a set of ballot initiatives for minimum wage increases, which voters approved in four states and two cities. But now the real work begins. With several thousand workers slated for a raise in Alaska, Arkansas, Nebraska, South Dakota, San Francisco and Oakland—plus a slew of other state and local wage-hike proposals in the pipeline—the pressure is on to ensure they actually get paid in full. Regardless of what the minimum wage law says, many workers inevitably end up earning less. Employers get away with rampant wage theft because of ineffective, understaffed regulatory agencies, or because workers are fearful about complaining, or just unaware of their legal entitlements. The central problem in minimum-wage enforcement is that it tends to be complaint driven, which puts the burden of reporting on the worker. If you’re earning less than minimum wage, you’re likely severely poor by definition, and have little incentive to risk your job to just claim the couple of dollars a day your boss skims off your paycheck. As more states and cities explore minimum-wage hikes, it’s more important than ever to ensure that wage laws have real teeth. Seattle is the case study examined in a new analysis by the National Employment Law Project (NELP). The city became a model for minimum-wage campaigns last June, by passing a landmark $15 floor wage, phased in over seven years, affecting an estimated 100,000 workers. But whether they all get paid their due depends on whether the city can also create a model enforcement program. To that end, Seattle became the second city in the country (after San Francisco) to establish its own municipal office of labor enforcement, to investigate wage-and-hour violations and monitor employers on a local level. NELP’s model enforcement framework combines worker empowerment with aggressive investigation, including: “a robust worker and employer education program” and an enforcement strategy based on “a combination of complaint-driven and agency-directed investigations to restore minimum wages to all affected workers in a company.” Penalties should be high enough to dent business profits, and workers should be protected from employer retaliation, and be allowed to file private lawsuits over wage theft. Regulators and grassroots activist should develop partnerships to aid with reporting and investigation. Enforcement requires a broad-based approach because the low-wage sector is notoriously opaque, rife with high turnover, insecure jobs, lack of union representation and, increasingly, workers hired through shadowy, unregulated temp and staffing agencies. Other regulatory complications include employees working “off the books” or being misclassified as “independent contractors” to circumvent wage laws. All of these regulatory obstacles muddle lines of accountability and often leave workers unclear of how much they’re supposed to be paid and by what company—such as temp workers at a Walmart-affiliated warehouse, or an undocumented immigrant day laborer who works for a different household each day, paid in cash. There are good reasons for workers not to report. According to one survey of low-wage workers in New York City, Los Angeles and Chicago, about one in five reported experiencing labor violations, such as a safety hazard or being paid less than the minimum wage. However, “Over half (51 percent) of these workers said they did not file a complaint because they were afraid of losing their job. And another 10 percent were afraid they would have their hours or wages cut.” Undocumented immigrants are especially vulnerable, as are visa-based temporary guestworkers who are vulnerable to exploitation by their sponsoring employer. NELP recommends that labor inspectors proactively initiate investigations in low-wage sectors known for high rates of wage and hour violations, like housekeepers, retail sales, or restaurant work (where tipped minimum-wage levels are often set even lower). But regulators can expand enforcement by enlisting community groups, such as worker centers, which can bank on their social networks to broaden a regulatory agency’s reach. A trusted local organization can act as the government’s “eyes and ears” through providing aid and educational outreach. In San Francisco, about 30 percent of the complaints filed with the labor office are referred through community organizations contracted by the government. Policymakers can also beef up enforcement by increasing penalties for employers, for example, by ramping up potential damages for claimants, or allowing courts to put liens on an accused employer’s property, as backstop to ensure they can be held financially liable. But at the end of the day, the best “eyes and ears” at a workplace are the workers themselves. Though worker centers and labor inspectors provide crucial services and oversight, wage violations are a byproduct of the profound, structural disempowerment of workers in many low-wage industries. And of course, when workers are organized, have a strong union, and can collectively bargain over their wages and the condition of their labor, then workers won’t just be fighting to get paid the bare minimum—they’ll be setting their own pay rates. Until then, though, hundreds of thousands of workers will need the help of the law, and in an increasingly deregulated economy, the law will need help getting bosses to care.